Our new episode, “B Train Blues,” is brought to you without the benefit of any writing. I sat this one out. 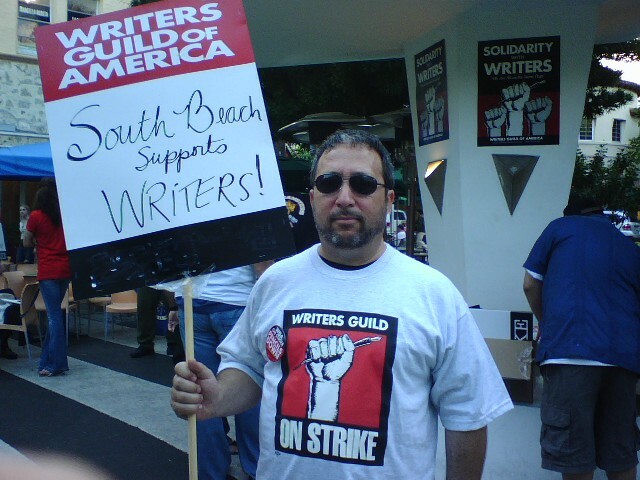 Here I am in a photo taken by the superlative photographer and great friend Linda Gale Gellman, standing on the picket line last week with striking Writer’s Guild members in South Beach, Florida. Frozen daiquiri anyone? My brother Orrin produced the B Train Blues. This time, the densely packed animation is the star of the show. This is closely followed by the sound design, performed by David Grimes. I couldn’t keep my hands completely out of the episode and composed the music. David arranged it. Hope you enjoy the new perspective. 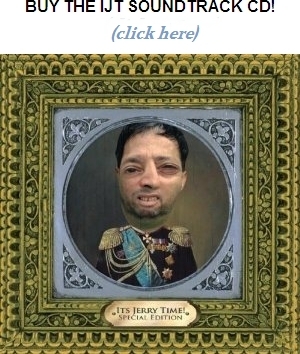 This entry was posted on Monday, December 17th, 2007 at 4:48 pm	and is filed under Uncategorized. You can follow any responses to this entry through the RSS 2.0 feed. You can leave a response, or trackback from your own site. Personally I liked the concept and now that I see the connection to the writer’s strike I like it even more! Keep up the good work! I look forward to these episodes. Every one seems to be even better than the last and I can never imagine them getting any better! You always surprise and delight me. This is absolutely the best entertainment on the web! Well Jerry, once again we managed to find ourselves in the thick of something. I vote to keep the beard and I want to see it in an upcoming episode! The beard may have the opposite affect of Samson and if that is the case we may have to have a new main character. What if the beard gives you some new super hero life advantages? I guess the fans will just have to wait and see. I want the killer leaping squirrel animated.